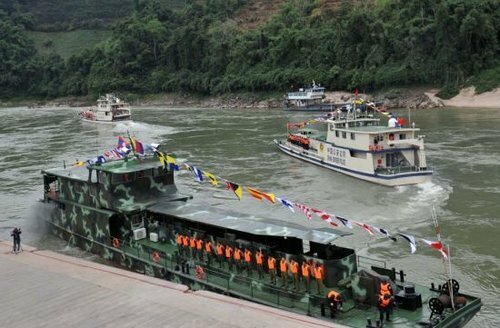 Four Chinese cargo ships and one Burmese patrol ship were attacked on the Mekong River on Jan. 4, river police in charge of security on the Mekong River in north and northeast Thailand told People's Daily. Quoting a police report, an officer said that the Myanmar patrol ship and Chinese cargo ships near a Burmese dock were attacked by armed assailants in the early hours of Wednesday morning. The report went on to state that the armed assailants fired M79 rockets at the ships, with the first rocket falling in the river and the second exploding near the patrol ship. Due to low lighting conditions at the time of the incident, the patrol ship was unable to determine the source of the attack and subsequently could not offer a meaningful armed response. The police report concluded that the incident has greatly affected shipping services on the Mekong River. Although no Chinese ships were hit in the attack, crew members expressed concerns over security on the river. Shipping services were restored on the Mekong last December after their suspension following the deaths of 13 Chinese sailors in cargo ship attacks on the river on Oct. 5, 2011.